Now you can be a Doctor Who fan with themed socks. These dark blue socks have the Tardis on the foot of the socks and then the top of the socks is covered in white dots and they do think of the dots on the Daleks so they are really perfect socks for the true Doctor Who fans. Your new socks are great for both men and women and they are made from 98% polyester and 2% spandex. 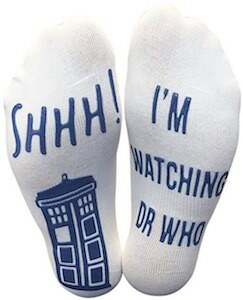 Now you can have the perfect socks that makes you think about Doctor Who when ever you look at them. 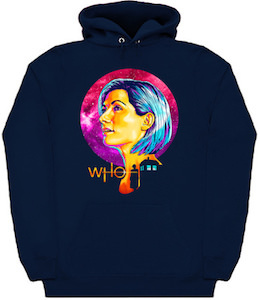 Doctor Who fans can now show their love for the 13th Doctor all thanks to this Tardis Girl Power T-Shirt. The t-shirt is available in a bunch of styles for both men and women and it comes in sizes Small – 6XL and a bunch of colors. 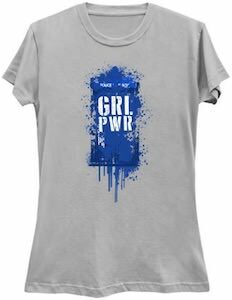 On the Doctor Who shirt you can see the Tardis as it looks like it is being painted on the shirt while paint is dripping and then on top of the Tardis it says “GRL PWR” which of course means girl power. 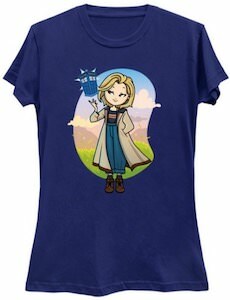 With a girl Doctor Who being in power this shirt is just perfect for a true Doctor Who fan like you. Now the true Doctor Who fans can sleep in style thanks to this Women’s Tardis Thermal Pajama Set. The women’s pajama set looks amazing as it is light blue with in the background some white lights that almost look like lightning and on top of that you can find the Tardis and not just once but many of them just flying around. You can get this Tardis sleep set in women’s junior sizes XSmall – 3XL and all are made from 60% cotton and 40% polyester. Now you can enjoy lounging around the house be comfy sleeping all thanks to these fun pajama’s that are also thermal to keep your nice and warm. Now there is a Doctor Who Tardis Cardigan With Hood for all the fans looking for something fun to wear. 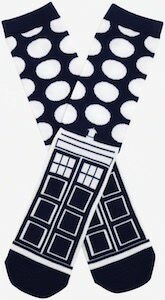 The Doctor Who cardigan is made from 100% acrylic and comes in women’s junior sizes XSmall – 3XL. On the blue cardigan you can find fun print on both the shoulder area and the lower part of the cardigan. Both area’s have a print that makes me think of fair isle and in the print you can find big snowflake and images of the Tardis too and the whole design is made in white which looks great with the blue. And this Tardis cardigan is extra special as it has a hood and there are pockets too. If you like Doctor Who t-shirt then you have to check out this 13th Doctor And The Tardis T-Shirt. 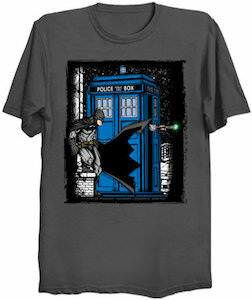 The Doctor Who t-shirt is available in styles for both men and women and comes in sizes Small – 6XL and in a bunch of fun colors. On the t-shirt you can see a roundish shape and in the shape you can see a landscape and some clouds are even moving out of the shape. In front of the shape you can find Doctor Who and this is the 13th Doctor and the first female Doctor Who in her typical outfit and floating above her hand you can find a small Tardis.